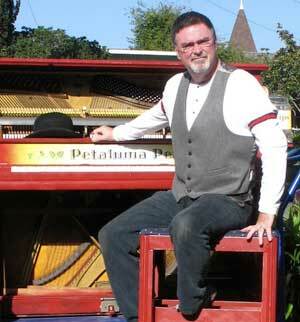 Petaluma Pete (the piano player) is actually John Maher. He and Brenda, his bride of 36 years, live over on 5th and C, just close enough for the honky-tonker to push his 800 lb piano to Western & Petaluma when it isn’t stored outside the Downtown Association office (Thanks, Marie!). John fell in love with Petaluma 2 years ago after moving here from SoCal, and brings 35 years of advertising & promotion experience with him.